There is a version of Google's Android platform being developed for the HTC Touch. It is not very awe-inspiring as of yet; it does the basic stuff- such as make/receive phone calls/SMS messages and browse the web- but that is about it. It is a development platform, so it needs a 'killer app' before it will become very interesting. There is a contacts option, but so far I have been unable to figure out how to enter information or get it to sync with anything (I assume it will be pointing to GMail contacts?). I also cannot find a 'menu' option that would all me to change system settings (such as the time- which appears to be set to GMT). 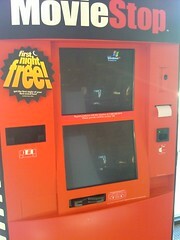 What OS does your movie rental machine use? Optical SPDIF instead of coax SPDIF: not much difference to me- my receiver can assign either. I contacted sales and they can cancel my A-100 order so I can place an order for one of the other units, but there are no details on shipping at this time- so it could be a week or it could be six months! I purchased a Shuttle SD30G2B bare-bones system about a week ago as a replacement for my media center PC. I also purchased an ATI HD3450 video card to provide HDMI video/audio output for the system. I setup the system (CPU, memory, HD, etc) and installed Vista Ultimate; the system worked great and no problems- until yesterday. The system would boot up and video would display but I was not getting any audio. My receiver indicated a 'HDMI PCM' signal, but no sound. Windows indicated sound was being output (via the audio indicator bars in the sound properties) but no combination of volume/outputs/tweaks would get it to work! I finally started looking around the ATI Catalyst menus for audio properties- but found none. I did notice that my resolution had changed from 720p to 800x600 (not sure how/why that happened). When I changed my resolution back to 720p the audio started working again! I will have to assume that the video card will only provide audio out when there is a HD signal being sent out? Yesterday I purchased another Klegg MediaShare from Fry's in hopes that they had improved codec support (it was also an 'open box buy' for $85) in the several months since I last tried one out- but it looks like they have been pretty stagnant with overall support. It appears that device has been re-branded under several names (such as the Novatron IAMM NTD36HD and the Zio eUreka LX350HD) with compatible firmwares, but none of these vendors are offering the one codec feature I am looking for: mkv file support. I returned the Klegg MediaShare to Fry's earlier today. While doing research for the Klegg firmware, I ended up at the Wikipedia entry for HD Media Players and at the end of the article they mentioned the Popcorn Hour player (cheesy name, but it sounded promising when they mentioned it in a HT Guys podcast). I found a good review (and video review) and it looks like almost everything I am looking for (plus some additional features such as YouTube, Flickr, and RSS feeds! ).